– Having decreasing property values. – Having damage to their health, due to lack of sleep and peace of mind. – Living with closed windows and doors, due to year-round noises. – Having exposure to infrasound. – The maximum outdoor dBA value, how that value is arrived at, such as by averaging over one hour, where that value is measured, such as near a residence, or at the resident property line to enable that resident to continue to enjoy his entire property. – How to measure, or calculate the outdoor-to-indoor sound attenuation of a residence. – How much setback is needed, such as one mile to minimize infrasound impacts on nearby residents. – The maximum dB value of infrasound, how that value is arrived at, where that value is measured. – How to determine the need for a 5 dB annoyance penalty. – Page 4, par 5.1.1 mentions averaging over various periods. Only the worst average readings of a period are to be considered for compliance. – Page 4, par 5.1.2 mentions a 5 dB annoyance penalty must be added to the worst average readings for a period for clearly audible tonal and impulse sounds with frequencies greater than 160 Hz, which would apply to wind turbine sounds. – Page 6, par 5.4 mentions limits for indoor A-weighted low frequency noise 10 – 160 Hz, and G-weighted infrasound 5 – 20 Hz. – Shadow Flicker: A shadow-flicker assessment must be completed for each residence, learning space, workplace, health care setting, public gathering place (outdoor and indoor), other occupied building and roadway, within a minimum of 1 mile of any turbine, based on shadow flicker modeling that assumes an impact distance of at least 1 mile from each of the turbines. Shadow flicker may not occur more than 8 hours per year at any of these locations. – Setbacks: The applicant must complete an assessment of the risks of ice throw, blade shear, tower collapse on any property, roadway, etc. A committee will determine, on a case-by-case basis, whether there is a concern with the setbacks and/or the appropriate distance that should be set. – Within 500 feet of a residence on a protected location or at the (project) property line, if closer to the dwelling. The resulting sound levels at a residence itself are usually lower than at 500 feet from the dwelling or at the property line where the 42 dBA “nighttime limit” applies. – Beyond 500 feet, the daytime limit of 55 dBA applies 24 hours per day. 1) Hayes-McKenzie Partnership recommendations made in 2006 limited maximum wind turbine sound levels at residences to 38 dBA and no more than 33 dBA if “beating noises” are audible. NOTE: Wind turbine capacities have increased since 2006; increased capacities, usually causes increased low frequency noise and infrasound. 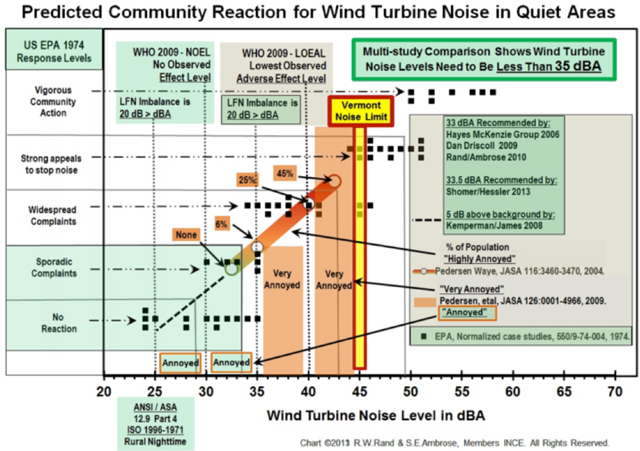 2) Dan Driscoll presented his analysis in 2009 (Environmental Stakeholder Roundtable on Wind Power, June 16, 2009) with a Composite Noise Rating analysis of 33 dBA to reduce rural community response to the level of “sporadic complaints”. 3) Michael Nissenbaum issued his findings in 2010 from his medical study at Mars Hill, recommending a 7,000-foot setback for public health. – The noise level not exceed 32 dBA AT THE PROPERTY LINE of any abutter of a wind turbine facility to ensure minimal LFN and infrasound content; the 32 dBA measurement would be a proxy for LFN and infrasound. – Wind turbine facility designers and their acoustical consultants would need to have a design target of 30 dBA to ensure 32 dBA is realized. – If utility-scale (1.5 MW to 3 MW) wind turbines are sited at least 1 mile from the property line of any abutter, it is likely any audible noise will be attenuated below 32 dBA. – To avoid devaluating any abutter’s property, etc., the abutter property line is used, because, for example, an abutter may want to use his land for one or more residences near the property line in the future. – Shepherd, D., McBride, D., Welch, D., Dirks, K. N., & Hill, E. M., “Evaluating the impact of wind turbine noise on health-related quality of life”, Noise Health, 2011. These studies all found that IWT noise contributes to sleep disorders and diseases associated with the serious adverse responses to the infrasound generated by the IWTs. – Rural Oregon has set the minimum setback at 2 miles. – Victoria and New South Wales, NZ have set the minimum setback at 2 km (1.25 miles). – In a settlement reached in a wind turbine dispute in Fayette County, Pennsylvania, the setback was set at 6,000-foot (1.1 mile). – An investigation into wind farms and noise by the UK Noise Association (UKNA)” finds an appropriate setback to be 1 to 1.5 mile setback (7,900 ft). – “Recommendations on the Siting of Wind Farms in the Vicinity of Eskdalemuir, Scotland (2005)” finds an appropriate setback to be 10 km (6.2 mile or 32,730 ft). – Beech Ridge Wind Farm (West Virginia) has a setback of 1 to 4 miles. Denmark holds infrasound is harmful to the health of nearby people and animals. Therefore, it has an infrasound requirement in its wind turbine code. Here is a chart and 4 articles prepared by Rand and Ambrose, two prominent acoustics engineers, which shows Vermont’s noise limit .